In September 1943, Lieut. Col. Hugo de Burgh, the Senior British Officer at Fontanellato PoW camp, together with Captain Reggie Phillips, made a daring and perilous escape over the Monterosa range in the Italian Alps to reach safety and internment in Switzerland. 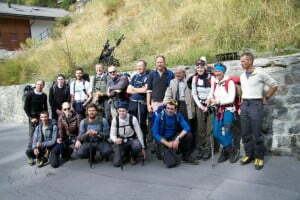 From 8th– 12th September, 2013, a party of 12 climbers, including three grandsons and five great grandchildren of the colonel, set out to commemorate the 70th anniversary of the escape by emulating his feat. Here, Christopher Woodhead, one of the grandsons, tells the story of their adventure – and how they celebrated on the summit. It was in the hut at the top of Italy’s Ayas valley, which cowers under the rocks, seracs and cliffs of the Monterosa range and was crowded with climbers profiting from the last weekend of the season before the huts closed, that I met Nick Parks, an English guide. After explaining the reason for our trek over the mountains to Zermatt, in Switzerland, he concluded that he was rather fed up with just going up and down mountains and it was marvellous to hear of a climb with real purpose, history and occasion. We, therefore, celebrated with some more hydration of the alcoholic kind, much to the concern of our own guides, before eating the communal dinner. The mountain huts have bunk beds reminiscent of the sort used in the prisoner of war camp from where my grandfather escaped 70 years ago, though they are sturdier and their slats have not been used to shore up tunnels. On the day that the Italians signed the Armistice in 1943, he and all 600 of his fellow inmates walked out of their PoW camp in Fontanellato, near Parma. Some went south, while others hid and formed partisan groups. My grandfather, Lt Col Hugo de Burgh, went north, however, to try to get to Switzerland. It is anybody’s guess what persuaded him to attempt climbing over the highest mountain pass of the Monte Rosa massif: he was quite old, (he had fought through the First World War earning a MC at Second Ypres), and in the Second World War he was captured and wounded in north Africa; he had a dodgy leg and was half-starved; and he had no kit. To his descendants, the seventieth anniversary of his climb seemed the right moment to emulate his feat. After a weekend in Fontanellato being entertained by the mayor and townsfolk, along with 60 other members of the Monte San Martino Trust, we arrived at Champoluc, the starting point for the journey, in pouring rain. Pouring rain at 1,600m means snow and ice at 4,000m. My grandfather wrote an account of his escape and, although hazy on much of the exact detail of his route, one of the few places that he records is Champoluc and, in particular, the Hotel Breithorn. We could not stay there as the Breithorn had closed for the winter but the extremely comfortable Hotel Castor extended its season to accommodate us. We proceeded to ensure that any stocks of beer that the proprietor might have been thinking of holding on to for next season would need reordering. The exact route is difficult to work out. 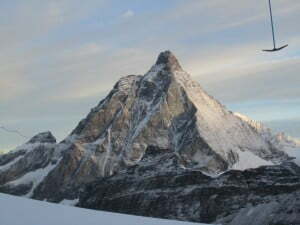 The only certainties in the account were; Champoluc, a reference to three of the peaks of the Monterosa range, Castor, Pollux and Lyskamm, and the Grenz (or Man Eater) glacier. We had worked out that, to tackle these in a sensible sequence, he would have climbed up to the Quintino Sella hut, traversed along the back of Lyskamm, over the Passo del Naso, and then over the Col de Lys and on down the Grenz to Zermatt. Our guides arrived in the morning to allocate our mountain kit – ice axes, crampons, harnesses and helmets – and give the bad news that the Passo del Naso, a difficult grade 45% climb on a good day, was covered with a sheet of ice and too dangerous. My grandfather would, of course, have ignored this sort of advice, as he indeed did, but in these days of disclaimer forms, insurance, etc, we decided with the guides on a complete change of route. The guides were from Chamonix and had driven over that morning. I wonder what they made of us and our special mission. If the Gallic sneer at some of the equipment was anything to go by – not much. But perhaps it was the tweed that really confused them: they had probably not seen tweed for climbing except in grainy, sepia photographs of 19th century climbers. The rain had stopped overnight and we set off in brilliant sunshine. Our back-packs now weighted down, we went up the Ayas valley through the pine forest, on above the tree line and onto the grass-covered moraines deposited by the glaciers. Alpine martins swept the surface of the slope seeking moths and flies to eat. And, all the while, the glittering white of the Monterosa massif loomed steeply above. Hoisting our packs back onto our sweaty backs, we continued our upward march, pausing for lunch at the Mezzalama hut. This was closed for the winter, although left unlocked as are many of the huts in case of emergencies, its red shutters fastened against the elements. The hotel’s packed lunch contained the ubiquitous ham and cheese sandwich, an apple and bar of chocolate. After a short break, it was back to the path, which was getting steeper and less grassy. We arrived at the ice. This field was fairly slushy and didn’t require crampons, so we slipped and sloshed our way to the other side and to the steep wall of scree that led up to what was to be our refuge for the night. 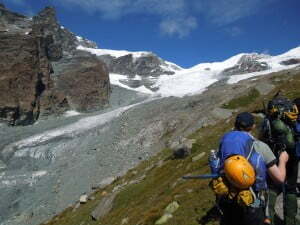 The slope became even steeper until we reached the fixed ropes to guide us up to the hut, the Rifugio Valley D’Ayas. It sits on a jutting nose of rock next to a glacier, the far side of which is a sheer cliff topped by a thick serac of ice. On a couple of occasions, part of this fell with a deep rumble, stopping conversation and causing eyebrows to be raised. So far so good, but the next day was to be the big one. Swapping our boots for “Crocs” (and fearing that there might be a bill outstanding for burnt lavatory doors), we bagged beds and, after a modest clean-up, joined the climbers of all nationalities assembling in the bar. We bought beers, played cards and chatted while waiting for supper. There was a choice of soup or pasta, followed by veal and courgettes and a pannacotta. Copious amounts of dry bread and grissini were on the tables. 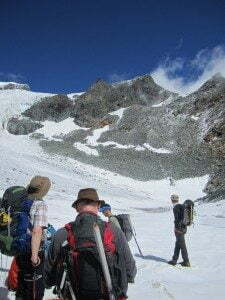 Then to bed: climbers tend to go to early, so as to rise early to enjoy the best, i.e coldest, ice on the glaciers. It is a regularly told mountain story that only those who snore badly remember to take ear plugs. Those who don’t snore, forget, and spend the night listening to those wearing the earplugs sounding off like express trains. We were 16 in our dormitory, including 12 of our party. It was stuffy, as well as difficult to breathe because of the lack of oxygen… not that the snorers seemed to notice. We rose at 6 a.m. and, after dry bread and coffee, we assembled outside to put on our crampons for the first time. It was very cold and it was with some nervousness that the party unfolded the crampon. Strapping these onto our boots and adjusting our waist harnesses, we roped up at three to a guide. Tying a double bowline on each of the middle walkers and a single bowline on the tail-man, we were roped at about seven or eight metres apart. The guide explained that, when going up he would lead, but when going down we would reverse the order. He would be at the top to act as a brake – which immediately begged the question about what happened if someone fell. “Just don’t”, seemed to be the best and only advice. 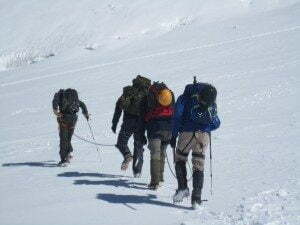 The first step onto the steeply sloped ice is made with some hesitation if you have not worn crampons before. The slope of this glacier, while not precipitous, did fall away sharply. It disappeared into the early-morning mist and down into what we imagined was a never-ending hole, as the four ropes of climbers tentatively moved out onto the glacier. The guides treated the glacier with great respect and, on a number of occasions, slowed from our already snail’s pace to test the snow. Often one was over the “danger” zone before realising that you had been on a snow bridge above a yawing gash in the ice. Because we were unable to cross the Passo del Naso we had, at the top of the glacier, turned west towards the Breithorn and Theodulpass rather than traverse east under Lyskamm. While our new route did not follow my grandfather’s exact journey, the spirit in which the journey was made and the experience were authentic. And because the new route was somewhat shorter, it gave us the opportunity to g a 4,000 metre peak. There are 81 peaks of over 4,000 metres in the Alps and to get to the top of one is considered quite a triumph. After traversing along the glacier below Castor and Pollux, the guides took a sharp turn up a particularly steep slope and across pockets of drift snow between the hard patches of ice and on and up to the base of the Breithorn. The pockets of snow were hard work but harder work was to come on the mountain itself. Pausing at the base of the Breithorn, we refuelled with water and biscuits before preparing for our ascent by shortening the length of rope between us and wrapping several coils over our shoulders. And so the small, ceaseless trudge began again. Gregg, our guide, decided to take the easterly route to the top and we followed the steeply slanting path for what seemed like an eternity. “Only five minutes more,” he said, as we turned and ascended an even steeper slope up between two rocks. It was then that we caught the wind. The small amount of rope between us bowed out horizontally as we hit the ridge. I don’t think any of us was expecting a knife-edge ridge and the strength of the wind was not what one wanted for what was for most of us our first experience of real “air”. Below to our right was Zermatt about 2,000 metres almost straight down; and on the left, was Italy. Knife-edge might be an exaggeration – there was room for both crampons on the top but not necessarily at the same time. We paused to turn on the camera to enable us to get a good all-round view of the ridge, not that you would know this from the film. The camera is focused rigidly on the boots of the climber in front, as were the eyes of each climber. We crept up the ridge with even smaller and jerkier footsteps. There was no turning around, no stopping; you just had to get on with it and follow the rope. Once we reached the top, the ridge broadened out to give room for handshakes, backslaps and cheers. It was my daughter Xanthe’s birthday so we sang “Happy Birthday”, wondering when it had last been sung at 4,000 metres. Then came the awful realisation that we had to go down the very path we had come up. And, if climbing up is scary, it is nothing compared with going down. First, the guide whose every move you have followed on the way up, will now be at the top. The rope is reversed and the tail man becomes the leader. Then there is the walking off into air part…. steeply downhill on a narrow path between very steeply downhill slopes on either side. When climbing up, the thing you most long for is to stop and come down. But, almost immediately you start to descend you realise that down is not so good after all. The change from screaming thigh muscles to the assault on the knee joints soon makes one consider the whole uphill thing more favourably. Once off the main summit, we struck off straight downhill, digging in the heels and going for it. Somehow, we were down in no time. We paused at the bottom and had our ham and cheese sandwiches. Once the legs had stopped shaking those who were brave enough admitted that the ridge had been more of a challenge than they had bargained for and, please, could we not do that again. We then set off, roped once again more loosely, for our hut for the night. Not the Monterosa hut on the Grenz/Gorner glacier but the Testa Grigia between Zermatt and Cervinia. We were now getting back into civilisation and the machinery of modern ski life began to impose itself on what had until then been a scene unchanged for centuries. This hut had smaller, if more cramped, bedrooms. A by now familiar hut routine developed with a great deal of beer rehydration and some interesting games of cards with additional mountain rules. Pelmanism with wild cards, for instance. At dinner we opened the champagne for Xanthe’s birthday. Her brother Hugo had carried this up 3,000 vertical metres to ensure a proper celebration. It is one thing to carry a heavy pack up to above 4,000 metres – it is quite another to carry a pack also laden with two heavy glass bottles. The bottles had been exported and imported into the EU about twelve times as we crossed and recrossed the border that runs along the summit. We strode down the glacier and, as the ice began to be replaced by scree we entered the cloud that had looked so magisterial from above. Closer acquaintance was less pleasant; however, it cleared as we descended further. As we approached the tree line on the path high above the river that tumbles down to Zermatt we could look back and up through a gorge to the Gorner glacier and the route that we might have taken. With some relief we decided that we had done enough, thank you. We were met in Zermatt by friends and relations and celebrated with coffee and cake outside the Hotel Monterosa, the place my grandfather “overworked the bath that night”. After several days of limited toilette we rather did the same. On this 70th anniversary trek there were three grandsons and five great grandchildren of the colonel, as well as four friends, retracing the steps of his dramatic escape. The de Burgh family generously raised sponsorship funds on behalf of the Monte San Martino Trust. Col de Burgh’s own account of his escape, Smugglers’ Way, was originally published by Blackwood’s Magazine in 1945. It is included in Home, by Christmas? (Appendix 3) and can also be read on this website in Escape Stories.